Equipment, including a generator, computers and peripheral devices at the Addis Ababa field station and South Omo sub-station were monitored and upgraded in order to facilitate research activities and communications between Kyoto and the Ethiopia Field Station. The security systems at the Addis Ababa FS and South Omo sub-station were also checked and improved. Repair work on the walls of the facilities of the South Omo sub-station was also commenced. 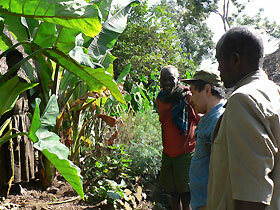 From November 7 to 24, we conducted study tours investigating enset (a banana-like plant) in Southwestern Ethiopia.Dr. SHIGETA Masayoshi, Dr. KANEKO Morie (COE Research Fellow), and Mr. MIYATA Hiroaki (an ASAFAS graduate student, year of enrollment: 2005) participated actively in the study tour.From November 16 to 19, Dr. Gebre Yntiso of Addis AbabaUniversity (our counterpart of the COE Program for the Ethiopia field station) joined our study tour of enset fields. We conducted extensive discussions with Dr. Gebre about the possibilities of conducting enset-based applied anthropological studies in Ethiopia. We also discussed the situation of agricultural development activities in Southwestern Ethiopia. As a part of our efforts to strengthen and sustain our relationship with our counterpart institutions, we proposed to give financial support for the fieldwork of three graduate students of the Department of Sociology and Social Anthropology, College of social sciences, Addis Ababa University. Continuous management and repair work needs to be done at the South Omo sub-station. Based on the current research results, we need to organize a small workshop focusing on the joint research theme of the Ethiopian field station, that is, “Creation of Multidimensional Symbiotic Society in Northeast Africa and the Role of Area Studies." 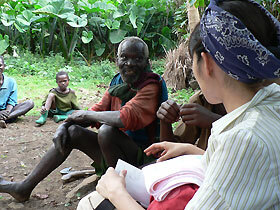 Photo 1: Dr. KANEKO Morie (COE Research Fellow) interviews an old man who was watching a wild enset habitat, called kaiduma. Photo 2: Dr. SHIGETA Masayoshi and Mr. MIYATA Hiroaki discuss the phenotypic diversity of enset pseudostems and the methodology for evaluating the diversity of enset at the South Omo sub-station, November 2004. Photo 3: Members of the study tour conduct research on agricultural activities in highland Southwestern Ethiopia using horses for the extensive survey. 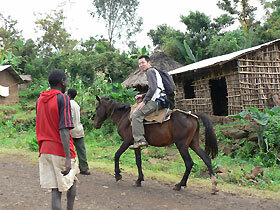 Mr. MIYATA Hiroaki is riding a horse for the first time.